Sir Arthur Conan Doyle is best known as a writer. However before he was an author he had another profession—he was a doctor. In 1881 Conan Doyle was awarded the titles of Bachelor of Medicine (MB) and Master of Surgery (CM) from the University of Edinburgh. The next logical step would be to establish his own practice or buy a share in an established practice. Both choices required money. Sadly, Conan Doyle’s finances wouldn’t allow for either option. Conan Doyle tried to find a solution. He applied for hospital posts, acted as a doctor’s apprentice for a time and considered moving to India. In the end, the African Steam Navigation Company offered him a position as a shipboard medical officer. In October of 1881 he reported for duty. Conan Doyle was no stranger to life at sea. The year before he’d served as ship’s surgeon aboard a whaling vessel. He quite enjoyed the experience. However life aboard the Mayumba, a 1,500-ton steam-powered barque, was not as agreeable as life on the whaler. Conan Doyle didn’t like the Mayumba’s ultimate destination, West Africa. He also found the trip boring. One trip of the Africa run was enough. Conan Doyle decided that he needed to find another way to fund his new medical practice. Conan Doyle and Budd were classmates at Edinburgh and both rugby players. After graduating from the medical program Budd initially established a practice in Bristol. However the cost of his plush lifestyle exceeded his income. 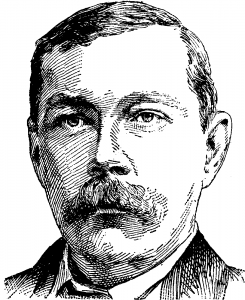 On Conan Doyle’s advice, Budd persuaded his creditors to give him additional time to meet his debts while he tried to establish a practice elsewhere. Budd’s flair for public relations and marketing were evident at the presentation to his creditors. Some people shed tears after hearing Budd’s stirring tale of a young man’s struggles in a hard world. Next, Budd moved to Plymouth. Things seemed to turn around for him there. In May of 1882 he sent word to Conan Doyle asking him to come and join the practice. Conan Doyle had mixed feelings. As a rugby player Conan Doyle found Budd to be “rather handicapped by the Berserk fury with which he would play.” Additionally, when Budd was a student he created a scandal by eloping with a girl who was under age and a ward of the court. On the other hand, Conan Doyle respected Budd’s intellect and passion. Conan Doyle asked three people for advice in the matter—his mother, Bryan Waller (a family friend and fellow physician) and Dr. Hoare (a former employer). The vote was unanimous. Everyone he consulted advised Conan Doyle against joining Budd’s practice. Conan Doyle did it anyway. One poor old lady he greeted with a perfect scream. “You’ve been drinking too much tea!” he cried. “You are suffering from tea poisoning!” Then, without allowing her to get a word in, he clutched her by her crackling black mantle, dragged her up to the table, and held out a copy of “Taylor’s Medical Jurisprudence” which was lying there. “Put your hand on the book,” he thundered, “and swear that for fourteen days you will drink nothing but cocoa.” She swore with upturned eyes, and was instantly whirled off with her label in her hand, to the dispensary. During his stay with Budd, Conan Doyle and his mother, Mary, kept in contact through letters. George Budd was a frequent topic of the letters. Mary disapproved of Budd and was not shy about making her feelings known. It was one of the few things that she and her son disagreed about. When the partnership was about two months old Budd told Conan Doyle there was a problem. Profits had fallen and there wasn’t really room for two doctors in the practice. Later Conan Doyle put the pieces together. Budd had found one of Mary’s letters and was upset about it. That’s what lead to the dissolution of their partnership, not a shortage of money or patients. Well, I wrote him a little note–only a short one, but with, I hope, a bit of a barb to it. I said that his letter had been a source of gratification to me, as it removed the only cause for disagreement between my mother and myself. She had always thought him a blackguard, and I had always defended him; but I was forced now to confess that she had been right from the beginning. Conan Doyle left Plymouth a little wiser. His next stop? He decided that for once and for all he was going to start his medical practice. He set his sights on the Southsea area of Portsmouth.